Every two years, the FJR community gets together for a North American meet hosted by one of the regional FJR groups. If you’re picturing a large group of pirates, rumbling down the road en masse, you’d be off base…it’s way more low-key. Essentially, 80-120 riders gather, split off for small group rides (4-8 bikes, if that) and generally turn a few hundred miles a day before returning to the venue for an evening of parking log socializing and hijinks. 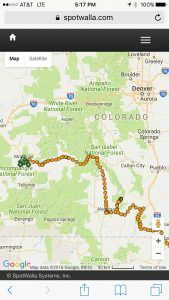 This was the year for NAFO to return, this time in Montrose, CO from July 28th through the 31st. Given the location, a number of riders opted to trailer their bikes in, a practice humorously frowned on in the community, and bring along a dirt bike as well in order to take advantage of everything western Colorado has to offer. 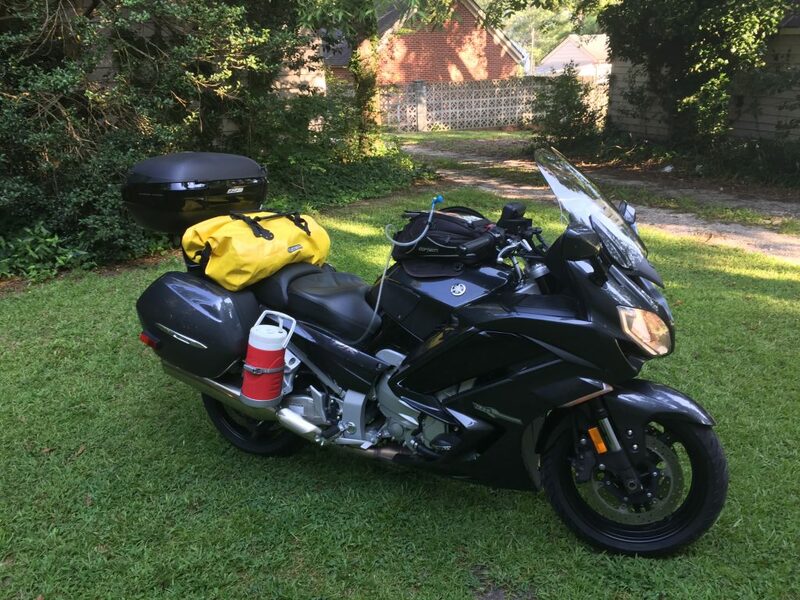 I had the vacation time needed, two weeks, and had the bike; another adventure was in the offing! 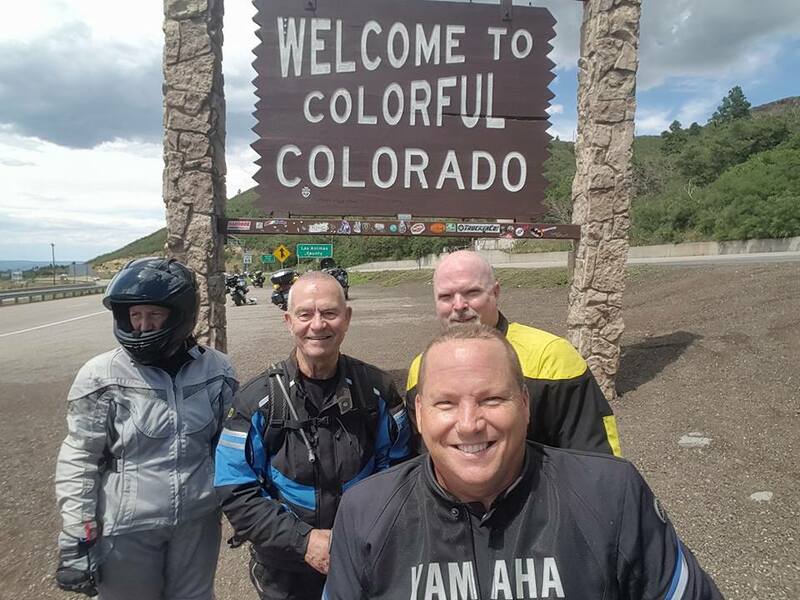 Initially, I was going to ride to Colorado on my own; however, as the days to departure counted down, my good friend Bob, a fellow Jarhead from northern Virginia, joined me as his wife had to back out (they were going to trailer). 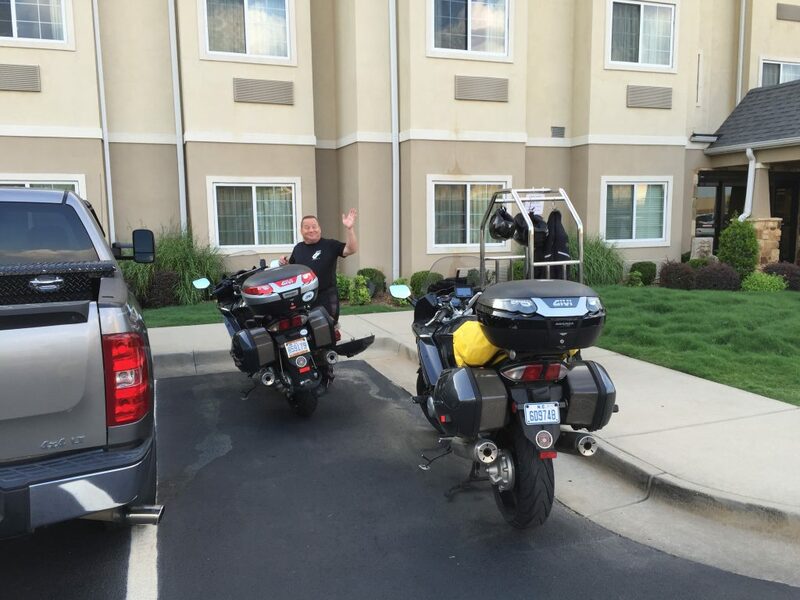 Lisa, a friend of Bob’s and a practiced long distance rider, was also going to join the adventure. The group was set; we’d have two 2015ES’s and a green 2007 in our party for the start and later be joined by Petey in Stillwater, OK on his BMW. Bob proceeded to work up a route plan out to Montrose that had us seeing very little interstate and as many good roads as he could find given our time constraints and meet-up with Petey in Stillwater. 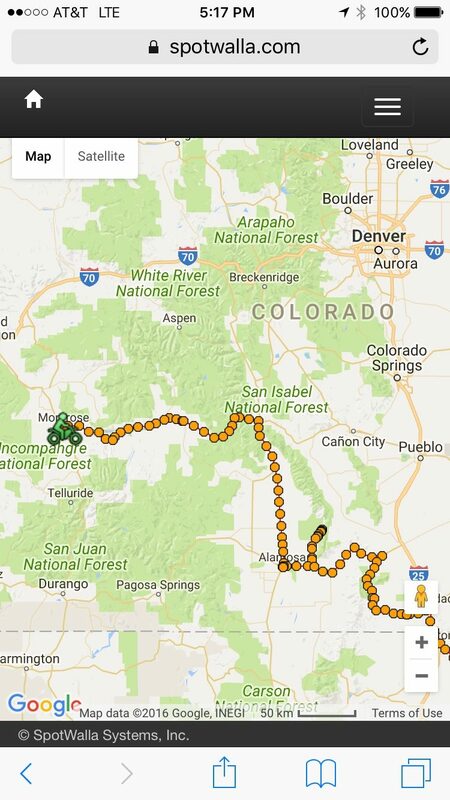 Our route to Montrose. It picks up from Maggie Valley, our day 2 starting point. Bob and Lisa started from the DC area and I started from Rocky Mount, NC. 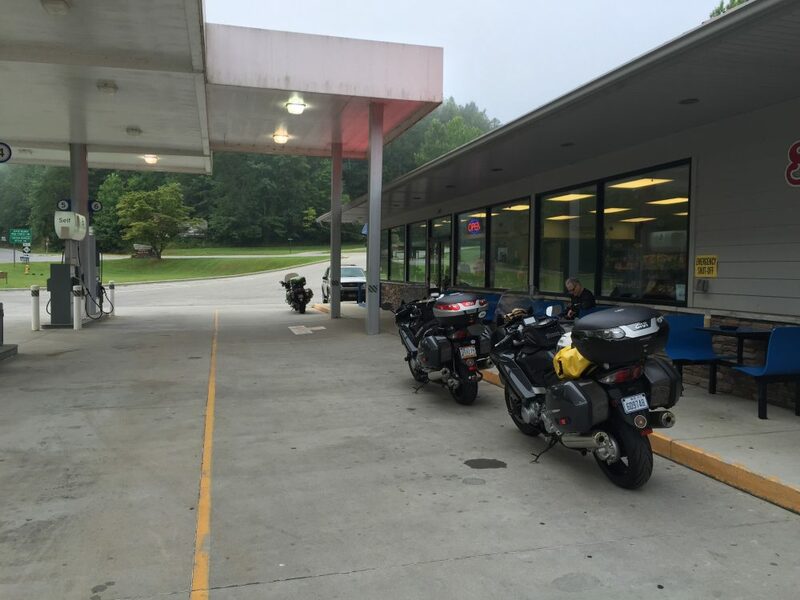 We were to meet at a Sheetz in Greensboro, NC and then continue on from there to our first overnight stop in Maggie Valley, NC. While Bob and Lisa had to depart at the crack of dawn, I got to take it easy and leave later; Greensboro’s only about 2 hours away for me. Loaded and ready for departure! Hiding in the shade in Greensboro; it was HOT! 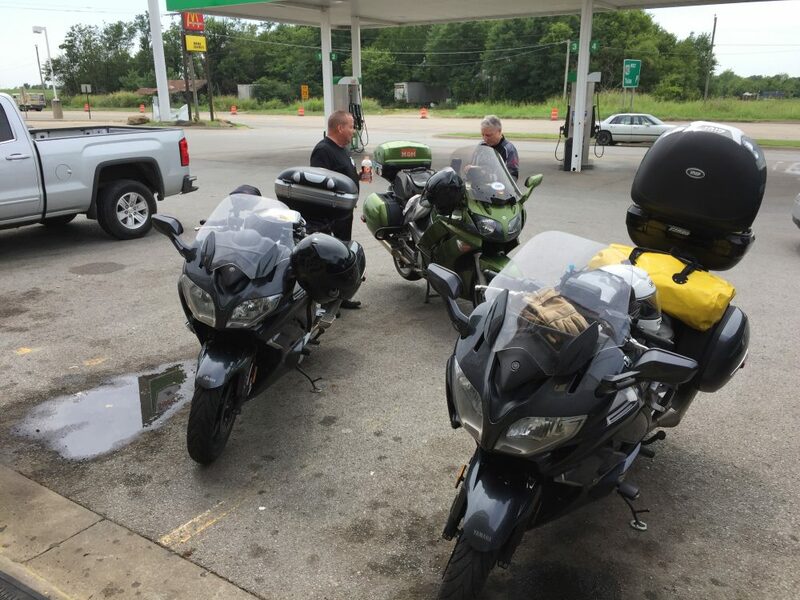 From Greensboro, we continued on and did a rather aggressive mountain run that placed us in Maggie Valley for the night, starting our goal to avoid the interstate as much as we could reasonably get away with. 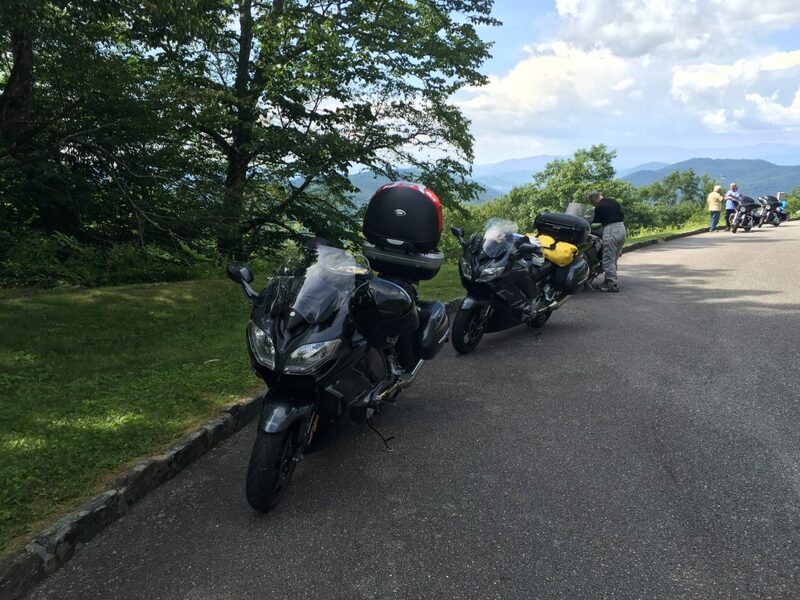 Photo stop on the Blue Ridge Parkway. Lisa’s back there tending to things. We got up early as we had a 600+ mile day ahead. The plan was to hit the Cherohala Skyway and then run across Tennessee and reach Searcy, AR for the night. 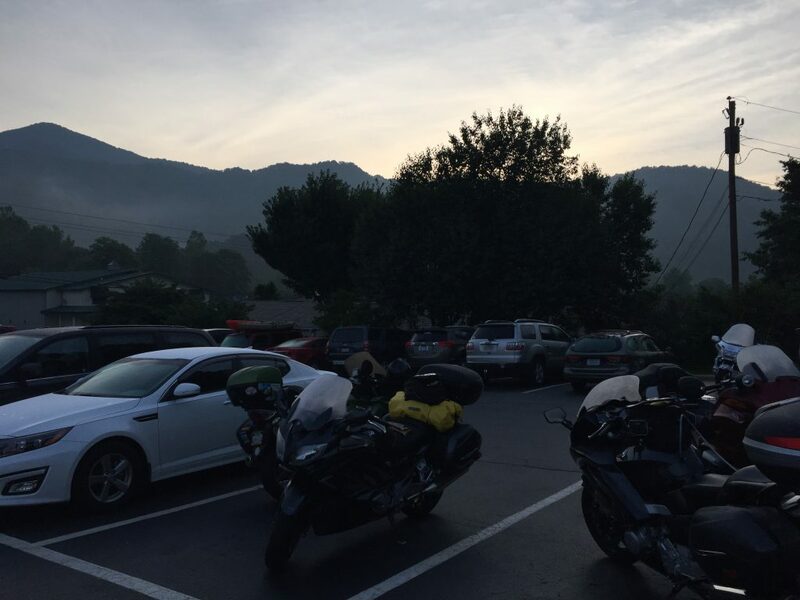 When we reached Robbinsville at 8am, we found that the fog was hanging low, which meant the Cherohala would likely be socked in for a bit…so we stopped to wait it out. The entrance to the Cherohala beckons behind the store as we wait out the fog. The Cherohala turned out to be fantastic! The road was empty, the fog had lifted, and we enjoyed a spirited run to the Tennessee side…then disaster struck. Bob and I both had Sena headsets, Lisa did not. Nearing the end of the Cherohala, Bob and I talked about stopping to check out Bald River Falls, deciding to take the goat path cutoff to it…that’d we’d just passed. Bob put up his hand to signal that we were going to turn around…I started slowing, then it happened…I felt a tremendous impact at my rear, then saw my top box flying over my left shoulder. 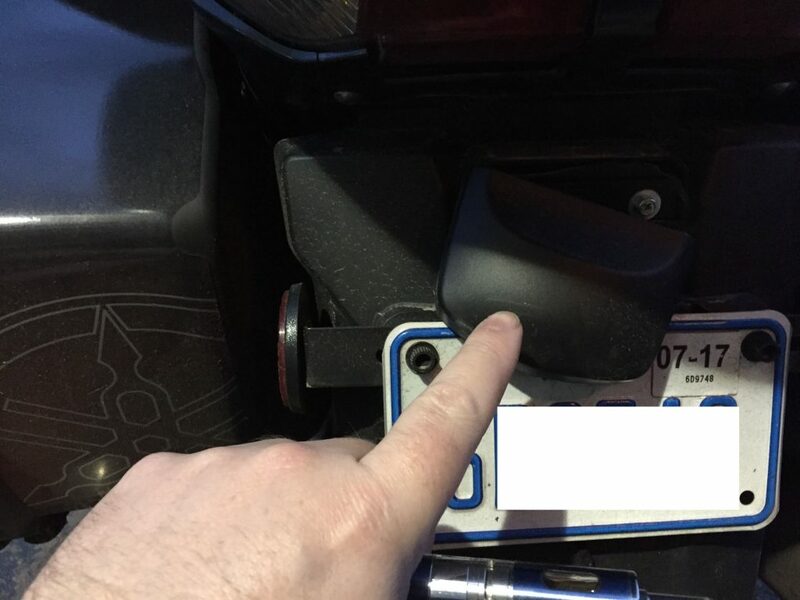 I had no idea what had just happened…I was too busy trying to stay upright, but Lisa had missed the turnaround signal and submarined the nose of her bike under my top box, popping it off the Givi rack. 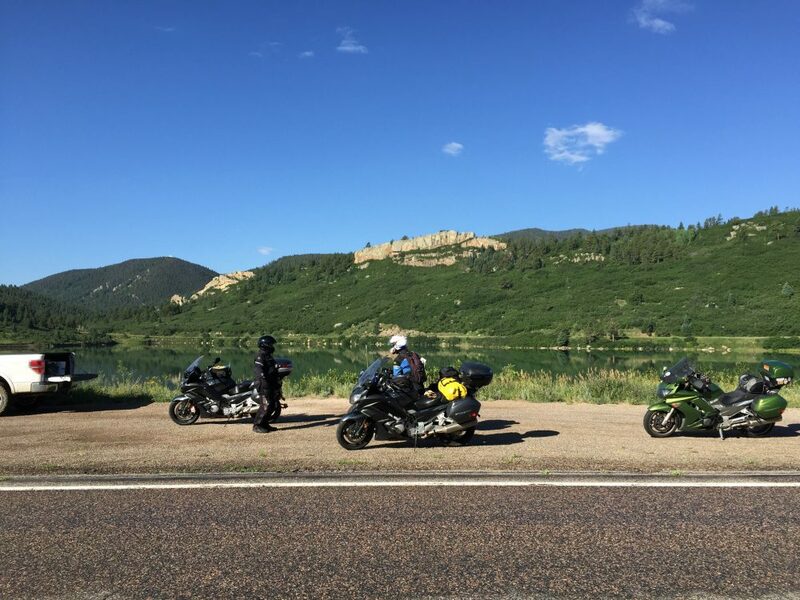 Both of us remained upright; I gingerly pulled my bike off to the side…there was no shoulder, but there was zero traffic and we were on a long straight with excellent visibility. 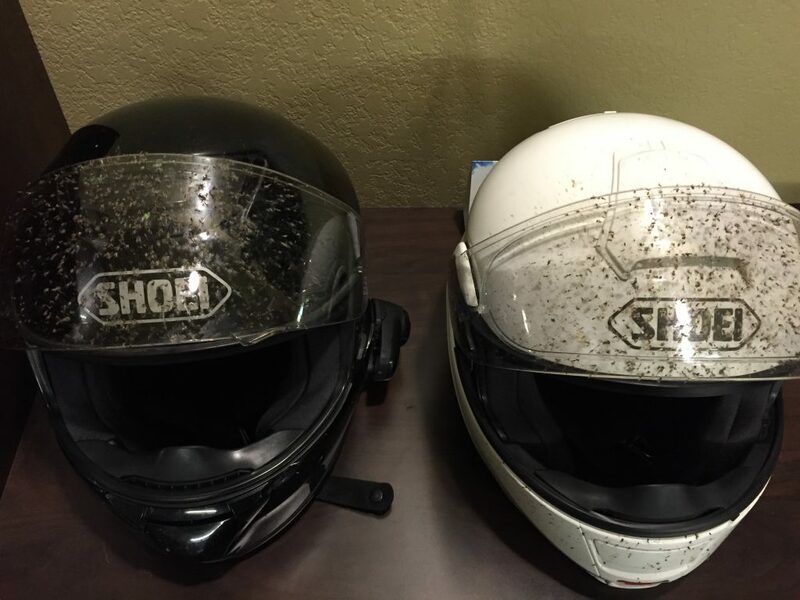 Both Lisa and I were unharmed and, after determining that, our focus turned to the bikes and a damage assessment. My E55 Tech box had gotten good air, according to Bob, and bounced down the road for a bit before spilling its contents across the road. The AdMore lighting plug was shaved down to an unusable state, but other than that, the box looked fine apart from a lot of road rash. The contents, largely consisting of spare gloves, my shower kit, a jacket plus some odds and ends also fared well. We feared trip-ending mechanical damage on my bike, but a closer inspection revealed only a broken license plate light bracket and a crack in the plastic surrounding the tail lights; Lisa’s front tire appeared to have slipped between my rear tire and the right-hand side bag, marring the reflective decal on the side bag, but nothing more. The connecting points on the exhaust cans revealed no damage and the rear wheel and hub looked normal…we got very lucky. 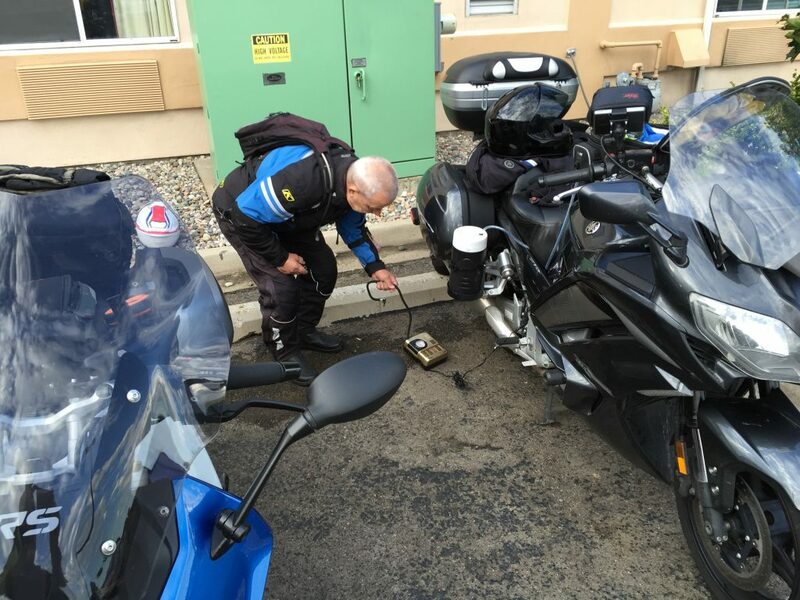 The SR357 Givi rack emerged unscathed, no breaks, chips, bends, or marks even. Lisa’s bike looked ok, apart from a few cracks in the nose; the forks and associated hardware looked ok. We hadn’t been moving all that fast, perhaps 30mph at the time of impact…that made the difference I think. We gathered up my belongings scattered across the road, piled them in the rashed E55 and popped it back on my bike; it locked normally (and remained in working order and watertight throughout the trip). After some minutes of settling down and reflecting, we moved on…parts and plastic are replaceable (and were after the trip). 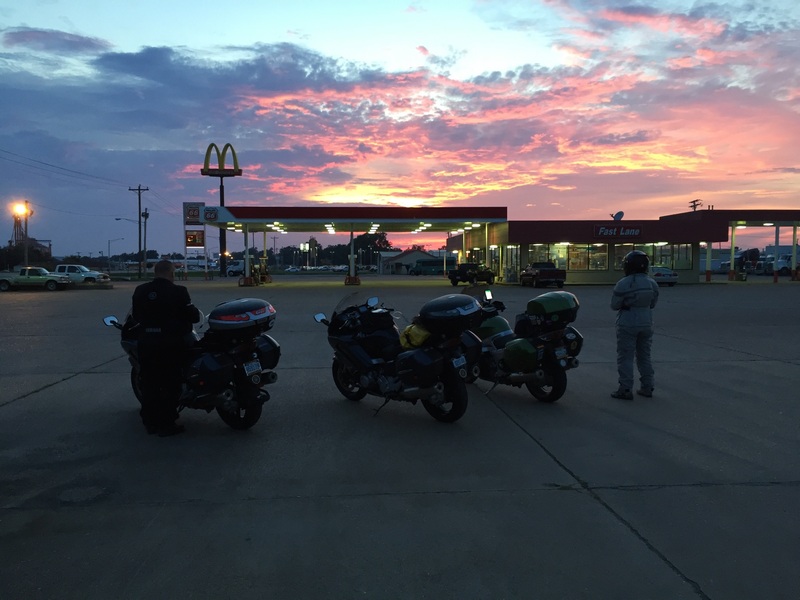 Stopping in Wynne, AR before carrying on to Searcy. 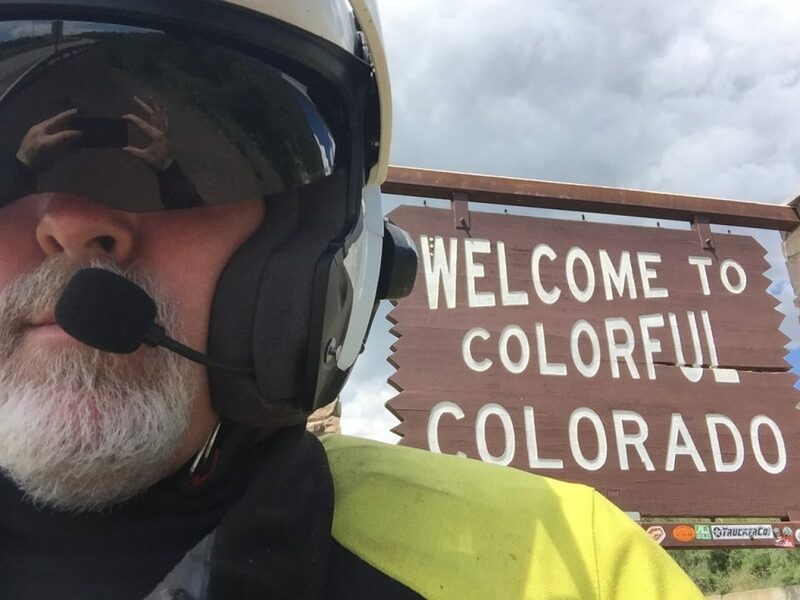 Today’s big goal was to reach Stillwater, OK and meetup with Petey…really only a 400 mile day. Before we got there, though, we had the Ozarks to look forward to! 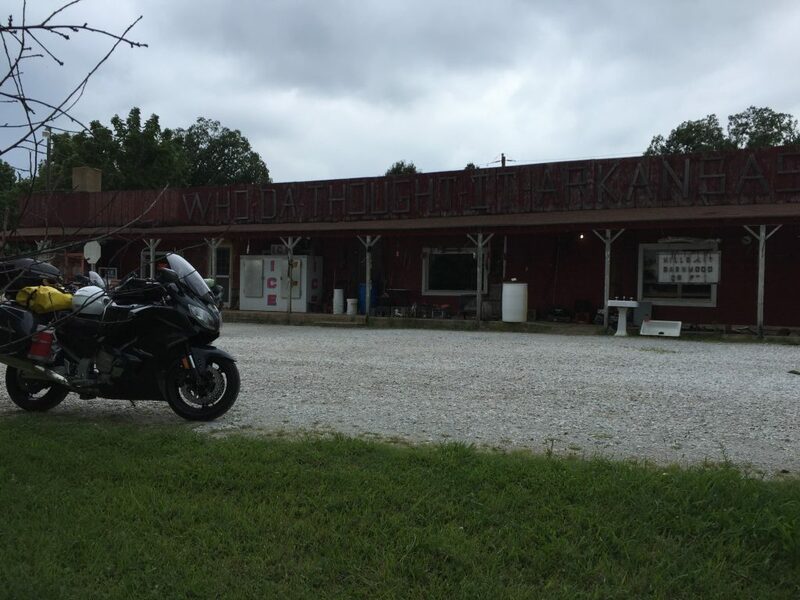 Day 3’s route to Stillwater, OK. A twisty run in the Ozarks! Bob was happy about the upcoming route; I was looking forward to it as well since I’d always heard the Ozarks were fun. You’ll note the hardly visible damage on my bike (my top box is unlocked for loading). Bob’s loading up his bike; mine sits ready behind his at Searcy. We tried to dodge the rain on 16, but it hit us here and there. Despite that, we found Highway 16 to be a really fun ride and wished we had more time to explore more of the area. 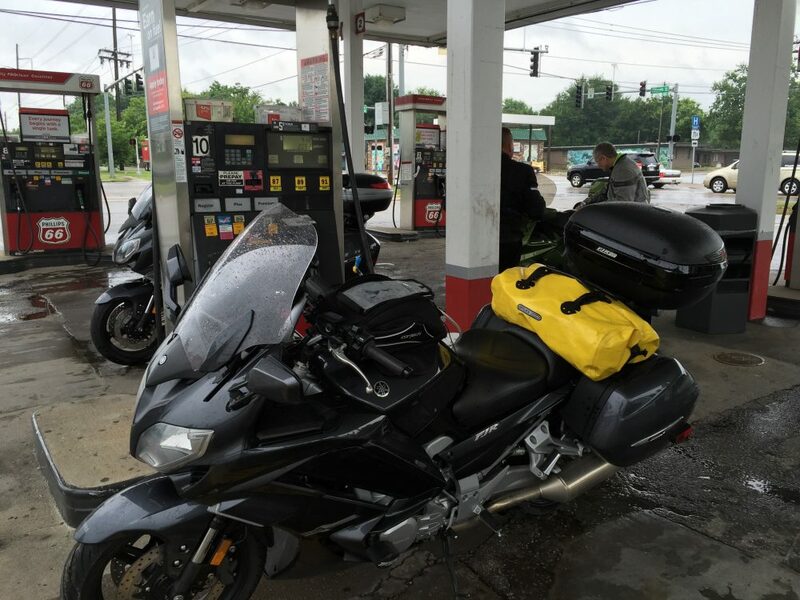 We continued on to Fayetteville, where we needed an excuse to get out of the rain, so we topped off the tanks and grabbed a light snack for lunch. 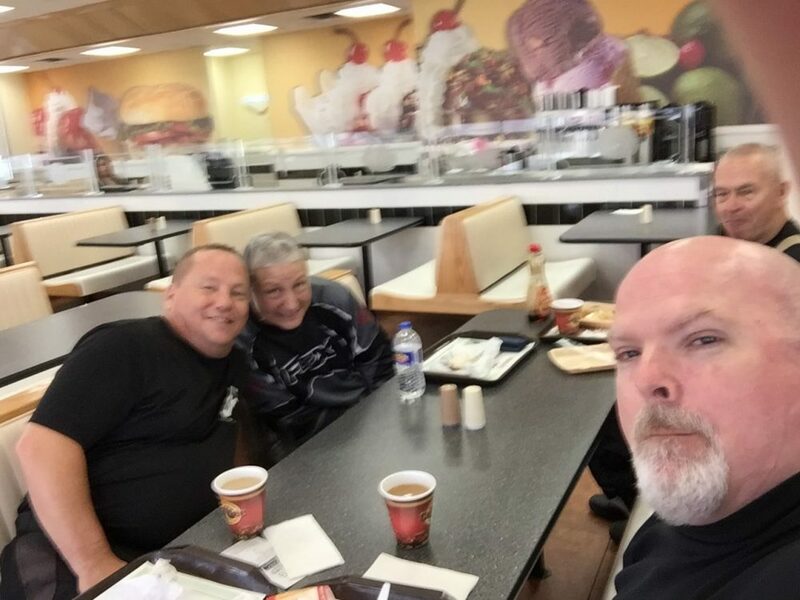 Taking a break in Chouteau, OK. Bob and Lisa BS’ing. We finally reached Stillwater in the early evening hours and managed to find Petey’s house. Petey’s an old fella, but under the surface lies a kid who loves to ride…and ride hard; more on that later. Bob and I left Lisa at Petey’s house, where she was staying for the night, while Bob and I headed back into town and the hotel. 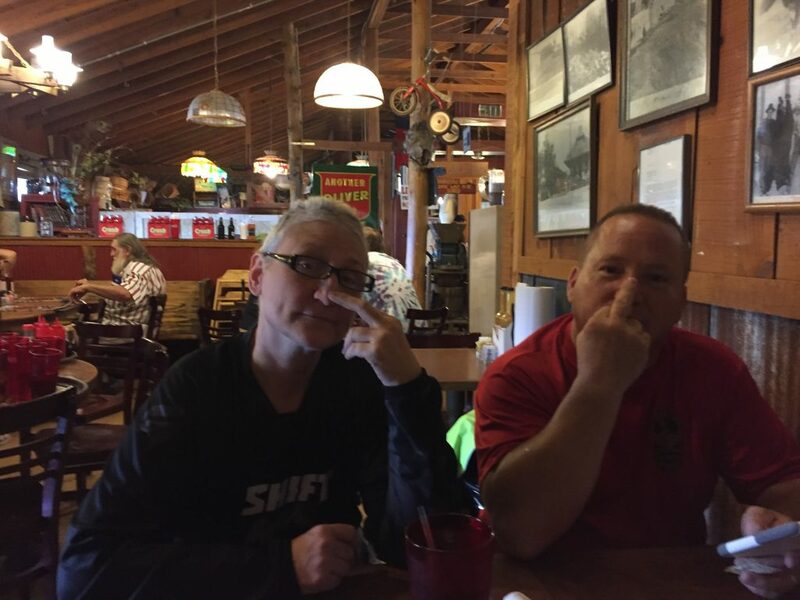 We had planned to drop our stuff at the hotel and ride back over to Petey’s to change Lisa’s rear tire; however, Petey’s wife volunteered to pick us up at the hotel when we were ready. By the time we got back to Petey’s, they had already changed Lisa’s tire! With that, we enjoyed some cold ones and then headed out for a great steak dinner. 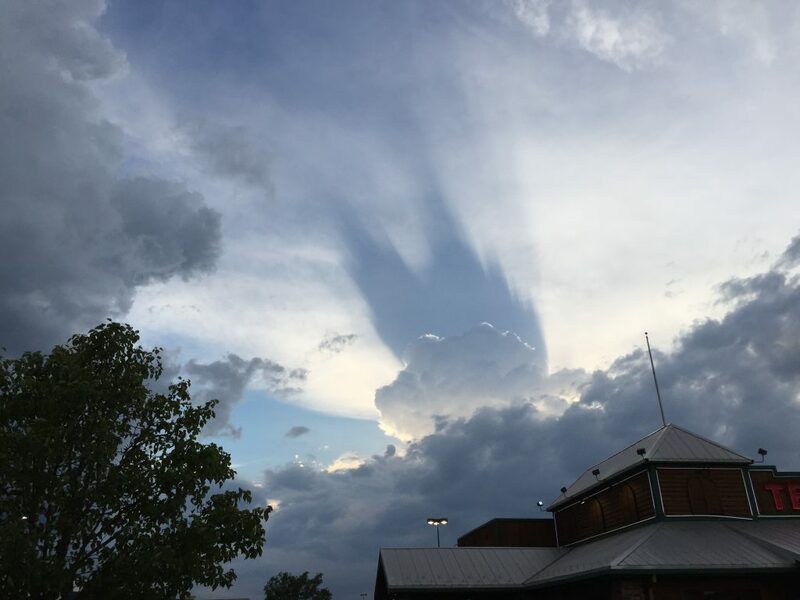 Just outside the restaurant, a storm was brewing. A storm had moved in overnight and its remnants were still around by the time Bob and I were getting ready to leave and head over to Petey’s again. Packing up for the run to Trinidad. Bob and I got to Petey’s at oh-dark-thirty, where we found both him and Lisa ready to roll. 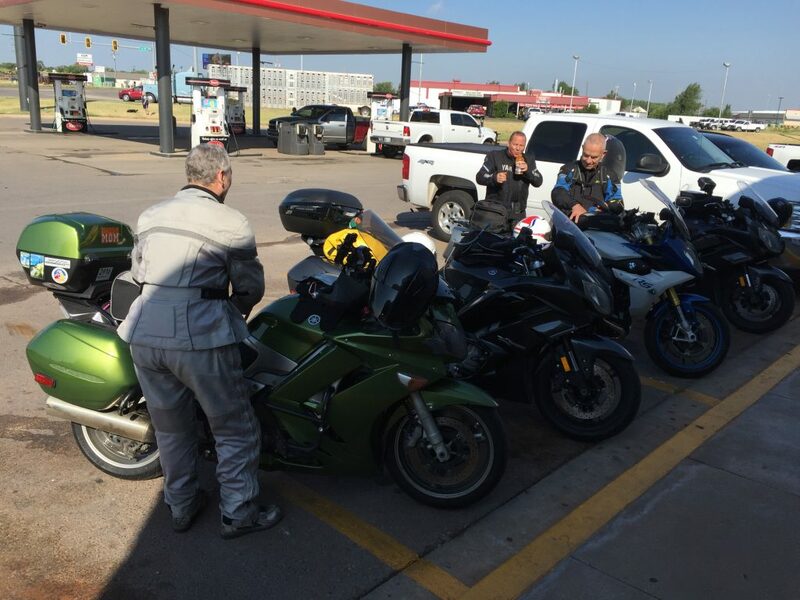 The first order of business was breakfast at Brahm’s, so we headed to Enid…and my blurry photo..
We hadn’t stopped for fuel the night before, so we stopped off in Woodward, OK to top off and push on. 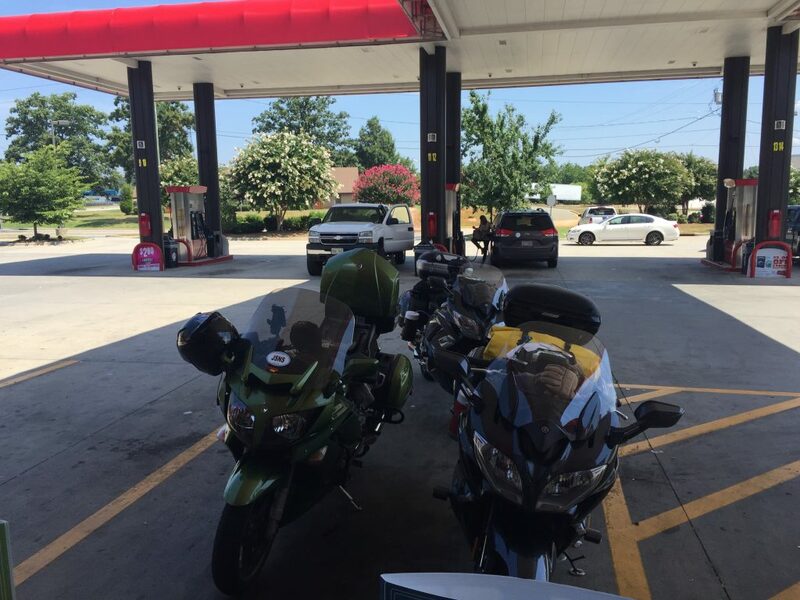 Petey’s riding a BMW with a smaller tank, so we stop a bit more often for fuel. We were thankful for the previous night’s rainfall as it kept the temperature cool for a good part of the morning. 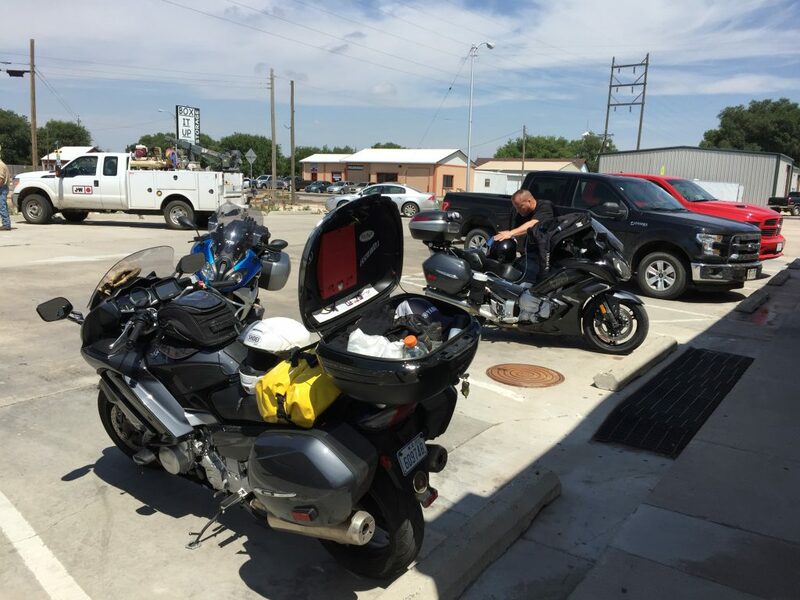 As you could imagine, riding through the panhandle of Oklahoma isn’t all that exciting, but we carried on to Guymon, OK to gas up and eat some lunch. There, we temporarily lost Lisa…she wasn’t hungry and decided to carry on; we’d meet back up with her before entering Colorado. 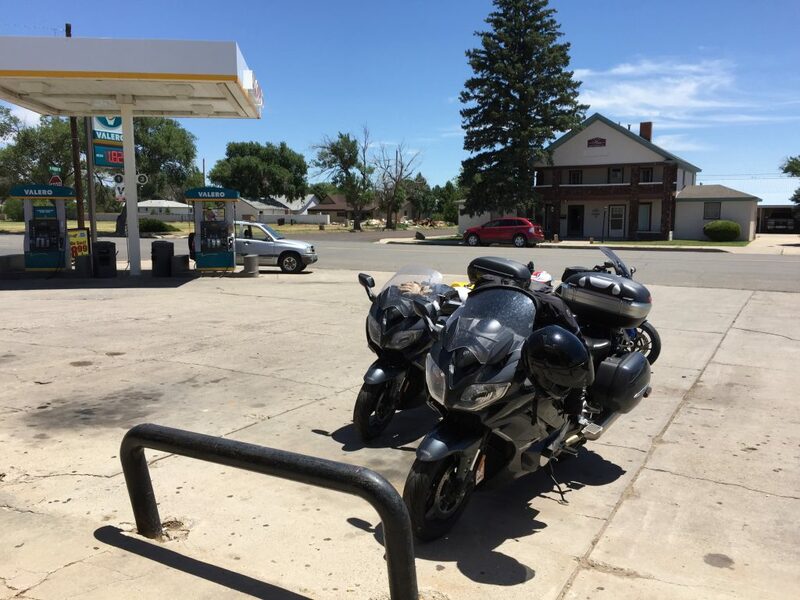 We stopped off in Clayton, NM to snack and top off the tanks. The views were starting to get better as the elevation got higher. At this point, I did not yet have a camera I could use while riding, but that would change later on. 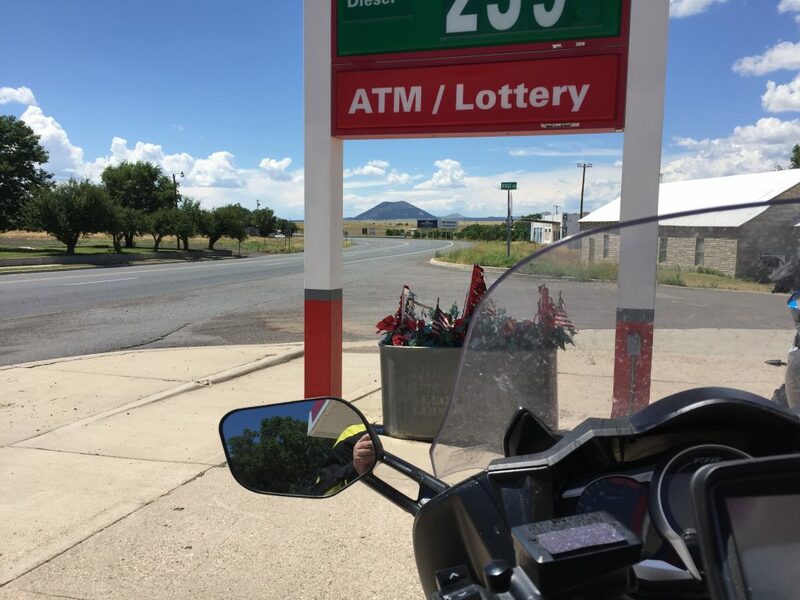 Later in the day in Clayton, NM for fuel. Lisa’s yet to join back. Des Moines, NM. A peak! Take a picture of the sign! 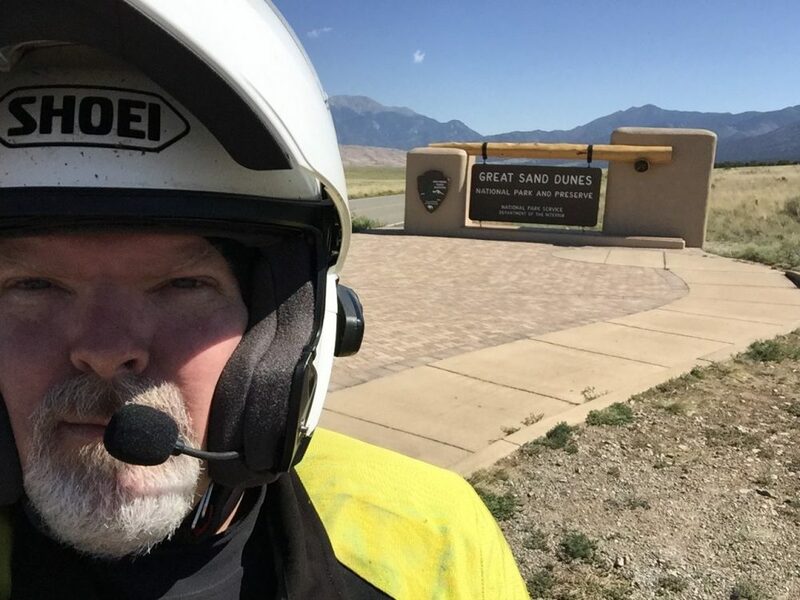 This is Bob’s take on the situation…our crew for this part of the journey. Bob’s selfie stick at work. Lisa, Petey, Bob, and me. Upon reaching our hotel in Trinidad, Bob and I unloaded, then went out to track down the nearest refreshment re-supply dump. 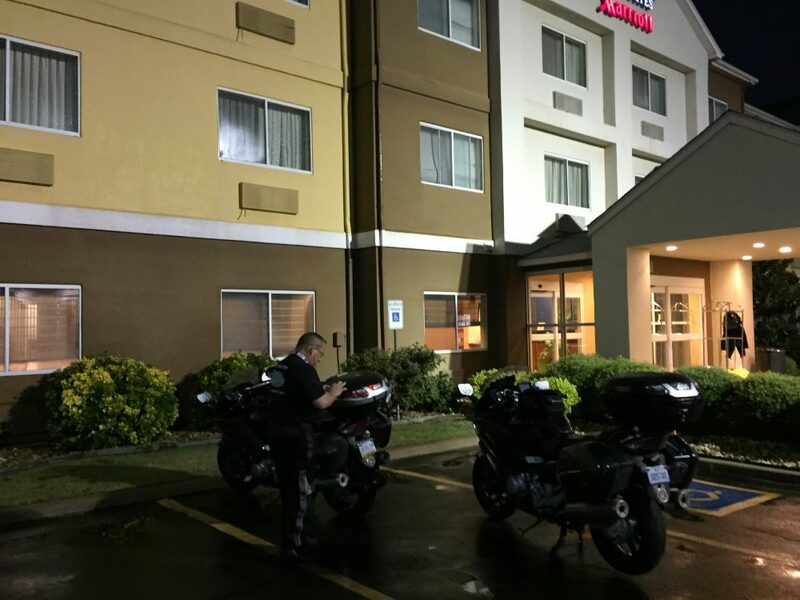 Later on, our merry band of misfits sauntered over to the local Pizza Hut takeout (only place in walking distance) and enjoyed the remainder of the evening talking bikes and routes in the hotel lobby. Petey borrowing Bob’s air pump to check his bike’s tire pressures. Enjoying the view while Bob tries to work the telescope (see the reflection). 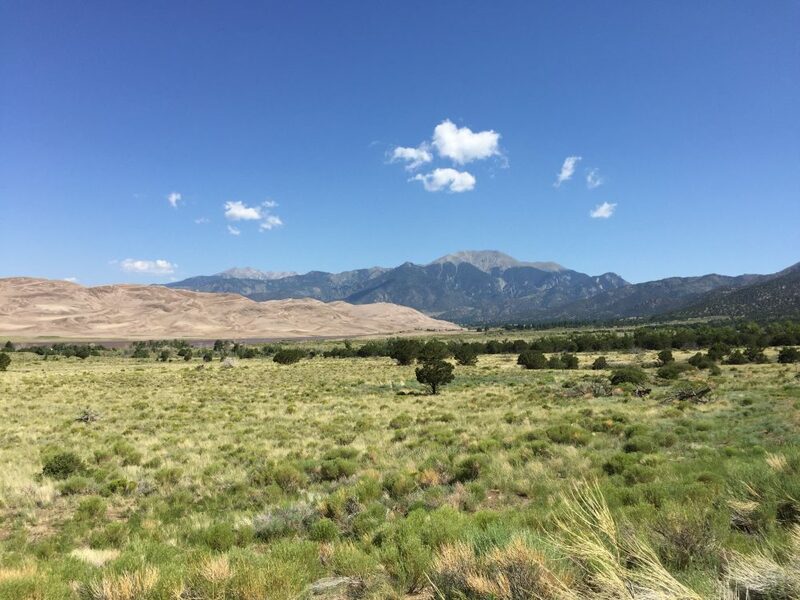 Once we finished touring the dunes facility, we headed back south down to 160 and continued west into Alamosa, where we enjoyed a hearty lunch at the San Luis Brewing Company. 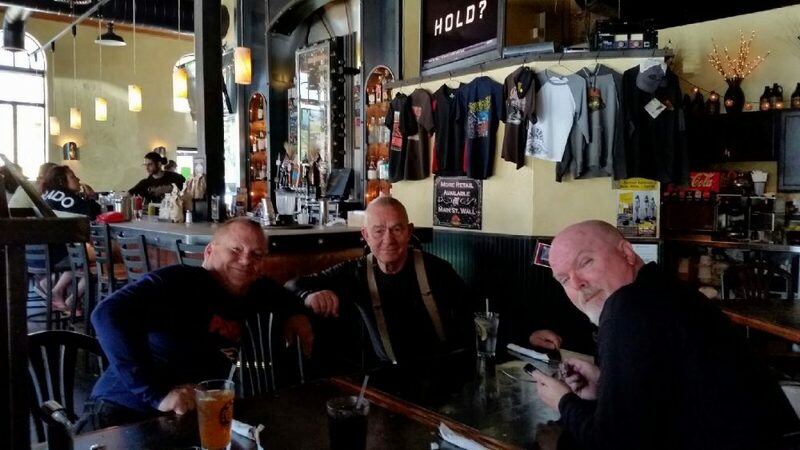 Lunch at San Luis Brewing Company in Alamosa. Bob, Petey, & Me. 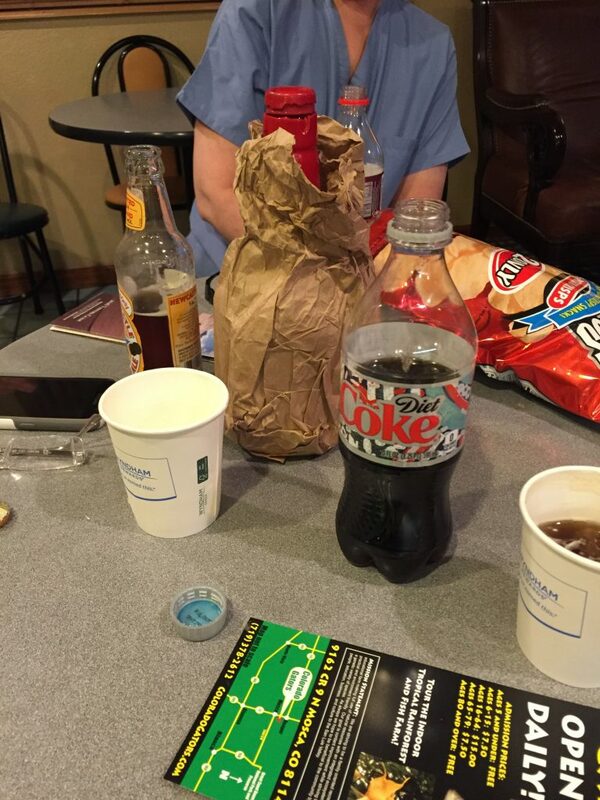 I think Lisa took this photo. 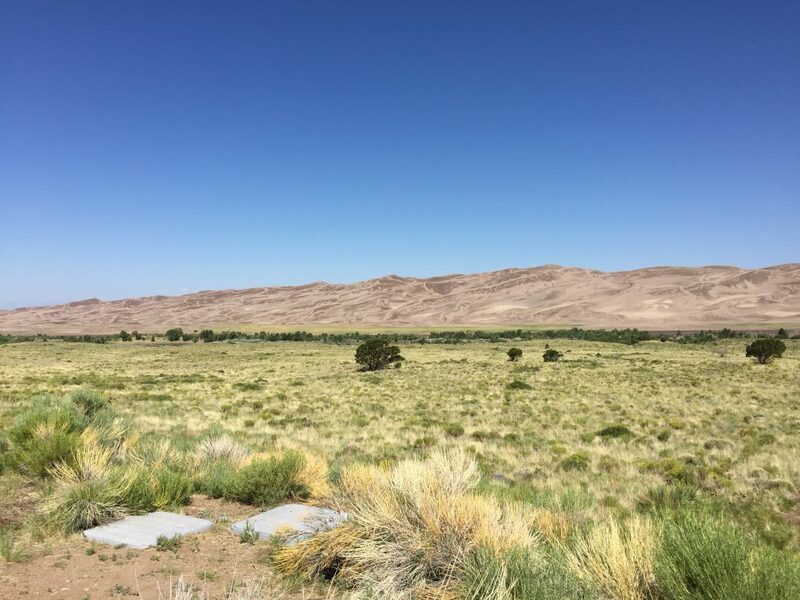 We arrived in Montrose in the late afternoon, with plenty of time to get settled into our digs at the Holiday Inn for the next few days and grumbling about the condition of US50. 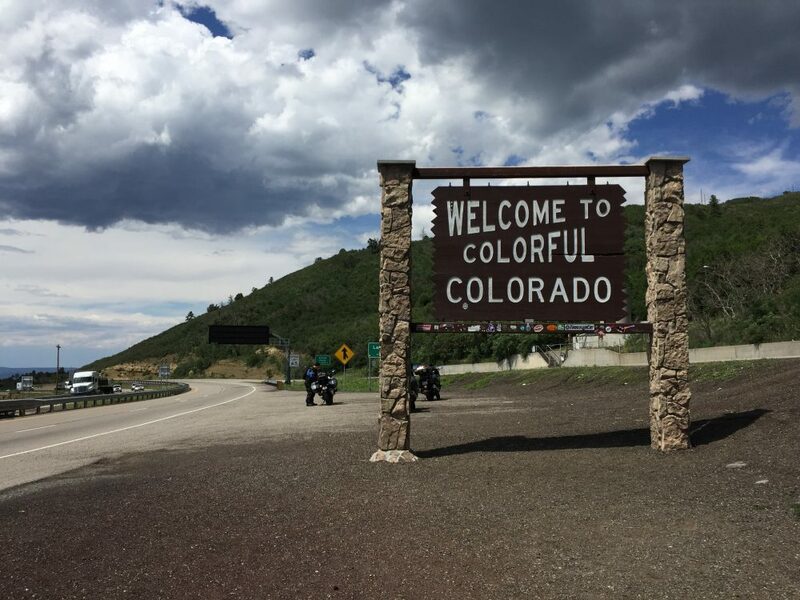 We’d learn a few days later that I-70 had been closed due to a rock slide and all the traffic was being detoured to US50 on the day we rode it…figures. This concludes Part 1; we’ve arrived! In Part 2, I’ll be covering our time at NAFO and Part 3 will cover our return to the east coast. 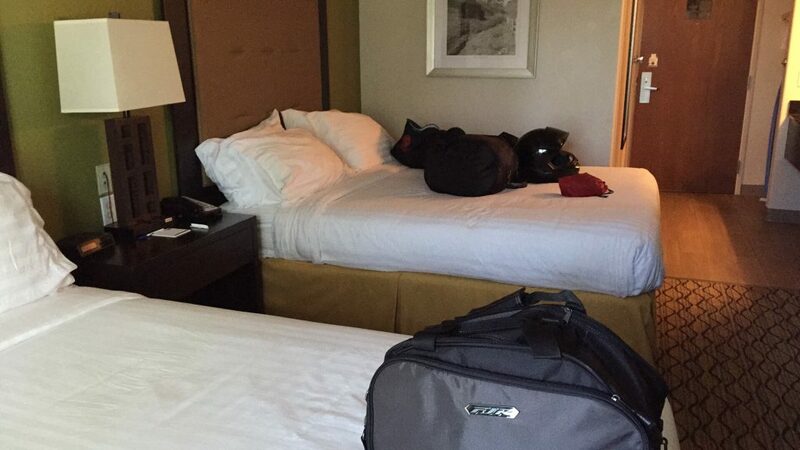 The room Bob and I were sharing for NAFO. 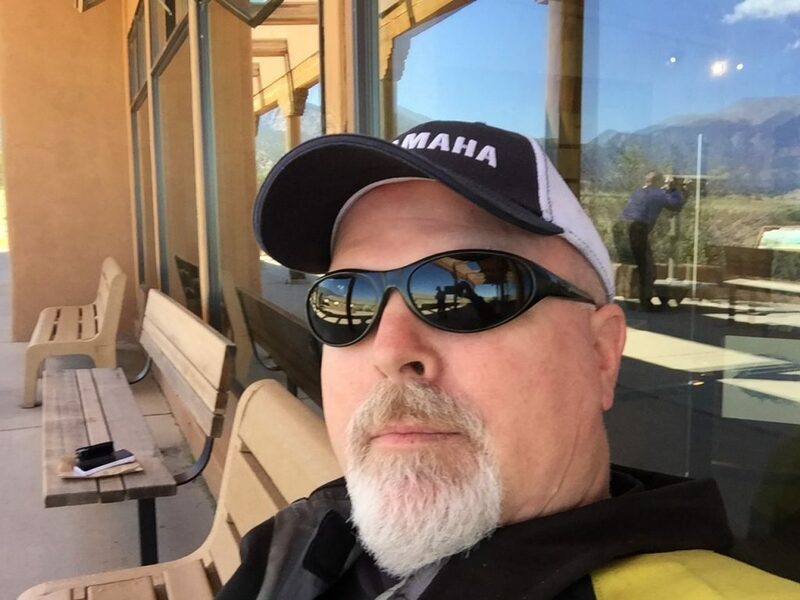 I live in Eastern NC, work on websites all day, and enjoy motorcycling immensely. What more need be said.